MOSCOW, March 20. /TASS/. Moscow is sorry that the United Kingdom has opted to stoop so low as to vilify Russia instead of cooperating with it on the Skripal case, Russian Deputy Foreign Minister Sergei Ryabkov said on Tuesday. "If they really want to settle this tragic situation, they should get in contacts and cooperate with us on the bilateral basis or within the OPCW (Organization for the Prohibition of Chemical Weapons). Instead, they are only throwing mud at us. A great power that has stooped so low as to use such methods can only excite pity," he said. "Russia could not violate the Chemical Weapons Convention as its entire chemical arsenals were destroyed last year under strict international control. All programs were stopped as far back as the 1990s and the British know it perfectly well," the Russian diplomat stressed. "It is unacceptable and unworthy to tell such bogus stories." Russian military intelligence (GRU) Colonel Sergey Skripal and his daughter Yulia were poisoned with a nerve agent on March 4 and found unconscious on a bench in Salisbury, UK. Both of them have been hospitalized and are in critical condition. 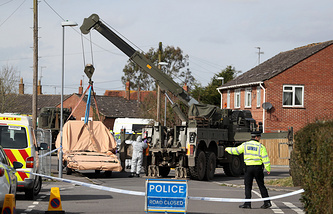 British authorities blamed Russia for the poisoning, but failed to provide any evidence to support their accusations. Russia refuted all of London’s allegations. With that, UK Prime Minister Theresa May announced the expulsion of 23 Russian diplomats and the suspension of high-level bilateral contacts. On Saturday, in response to London’s moves, the Russian Foreign Ministry reported that Russia had declared 23 British diplomats personae-non-gratae and would expel them within a week, close the British consulate general in St. Petersburg, and terminate the British Council’s activity in Russia. On the background of a frantic anti-Russian hysteria in the mainstream media, the British authorities rushed to issue charges to Russia but refused to provide a sample of the alleged nerve agent Novichok or any practical evidence in general. The Russian side has been categorically denying its involvement in the incident.